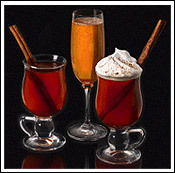 This 100% All Natural, mouth-watering spiced apple cider is produced in the mountains of Vermont and it can be served hot or cold. Enjoy now in a 16 oz. jug. Mountain Cider Spiced Apple Cider Concentrate is a delicious concentrated blend of apples and spices - no added preservatives! Mountain Cider is gluten-free, all natural, certified Kosher, GMO-free, allergen-free, caffeine-free, and has no added sugar or preservatives.